For sale is this special yacht. Strongly built by Kanga Birtles (Jarkan Yachts) for his own use. She was built as a short handed racing yacht. Still very competitive today. According to Kanga she would probably readily win a Syd Hobart as she is fast and would have a significant age allowance. Her current owner has lavished vast amounts of time and money to bring her back to a condition recognised by Kanga as "better than new". Built properly with vinyl ester resins the finish achieved is exemplary. Judicious use of carbon fibre, stainless steel and two pack paints showcase "Toccata's" fine aesthetics and detailed design work of John King. A recently overhauled Volvo diesel drives through a new stainless steel shaft, PSS seal to a new stainless steel Autostream feathering prop. The rudder and stock were replaced to the original design, then finished off with a new stainless steel tiller. AllYacht Spars supplied new spars and standing rigging, including a new ProFurl furler. The new boom includes a 2 position single line reefing system. New Brookes and Gatehouse instruments have just been installed in a new carbon fibre instrument binnacle. Also included are late model GME G-Deck stereo and VHF radio. New Jabsco toilet and plumbing. All new Marelon through hull fittings. New water bladders. The galley has a metho stove, an inbuilt icebox, plenty of storage, and a hand pump (designed to reduce water use). The refurbishment has been kept true to the original design philosophy: Fast and Light. This yacht now lends itself to further development into a fast cruising yacht, or leave it as is and enjoy competitive racing. Berths: There are 2 single berths in the main cabin, a V berth in the fwd cabin that can be used as a double. There are also mounts for pipe berths in the aft cabin area. 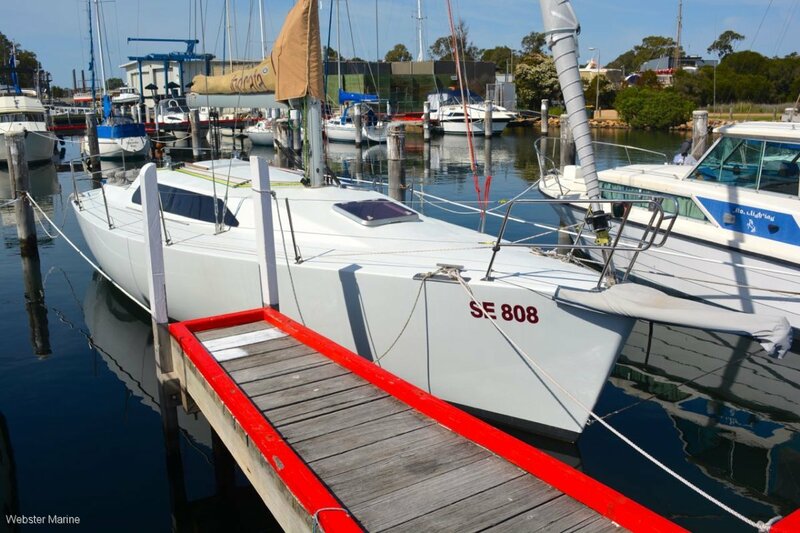 The further use of this yacht is as a fast racing yacht with an excellent age allowance or to add a few more creature comforts and go cruising. Items that could be added for cruising: Dodger (the stainless steel frames of the original dodger are included with the boat) Saloon table: Currently the owner uses a fold up table to keep the saloon area clear. Aft Pipe Berths: The original pipe berths are included with the yacht, and could be recovered and reinstalled for use The mounting blocks are still there glassed onto the hull. Anchor Winch:: There is plenty of space and strength to install an anchor winch. The space forward of the collision bulkhead would make an excellent anchor locker. A Bruce anchor (as new) and warp is included with the boat. There is no work to be done to resurrect this yacht, it's all been done. There are no underlying issues or unknowns, particularly because she is so well built from new, but also there is no inner hull lining to hide problems, (unlike so many other older yachts). This yacht has been well and truly refurbished by a true "boating tragic" she is ready to go as is or design your own minor modifications to take her cruising. PRICE NOW REDUCED - Buy with confidence that "Toccata" is as good as the owner can make her. Over $200k spent.